SHOREHAM, Vt., Sept. 5, 2018 /PRNewswire/ — Today, WhistlePig Rye Whiskey announces the release of The Boss Hog V: The Spirit of Mauve, the fifth edition of their most profound whiskey. As the biggest and best expression of WhistlePig, The Boss Hog is only produced when the brand feels they can create something superior to anything they have previously made. This marque fulfills the five promises WhistlePig makes to each edition of The Boss Hog: single barrel, bottled at barrel proof, powerfully complex, distinctly unique from anything they have done before, and stupendous. The Boss Hog V targets the senses with a unique balance between sweet and spiced flavors and a fine balance between American power and French sophistication. «The Spirit of Mauve is my favorite Boss Hog release so far. It is full flavored yet subtle, with lots of warm spice and apple notes. It’s like drinking Grandma’s apple pie.» explains Dave Pickerell, Master Distiller for WhistlePig. 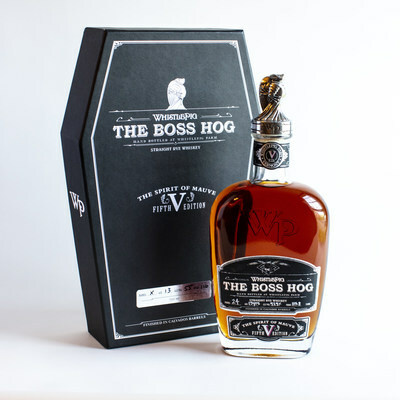 The former editions of the line include The Boss Hog IV: The Black Prince (2017), which was named Best in Show at the 2017 San Francisco World Spirits Competition, The Boss Hog III: The Independent (2015), Boss Hog II: The Spirit of Mortimer (2014) and The Boss Hog (2013). This newest edition is bottled at barrel proof and the suggested retail price is $499.99. Founded in 2008, WhistlePig is the premier aged Rye Whiskey, featuring the bold and often untapped flavor of rye. WhistlePig is leading a surge of innovation in the emerging field of North American whiskey. As the most decorated Rye Whiskey – having received the coveted ‘Best in Show Whiskey’ title from the 2017 San Francisco World Spirits Competition– WhistlePig is widely viewed as the world’s finest Rye. With the opening of its distillery on its 500-acre Vermont farm in the fall of 2015, WhistlePig has also become one of the leading farm-to-bottle Rye Whiskeys in the world.